Winter melon, also known as Ash Gourd and Winter Gourd is known to be a neutral and slightly ‘cooling’ food in Traditional Chinese Medicine (TCM). It is often consumed to bring down heat in a person’s body. This Winter Melon with Barley Soup helps to eliminate excess fluids, clears internal heat and weight loss. Winter melon goes well with most meats such as pork, chicken, duck and also seafood like prawns, fish and crab meat. The soup needs to be flavorful in order for the winter melon to absorb the flavors as it is bland on its own. 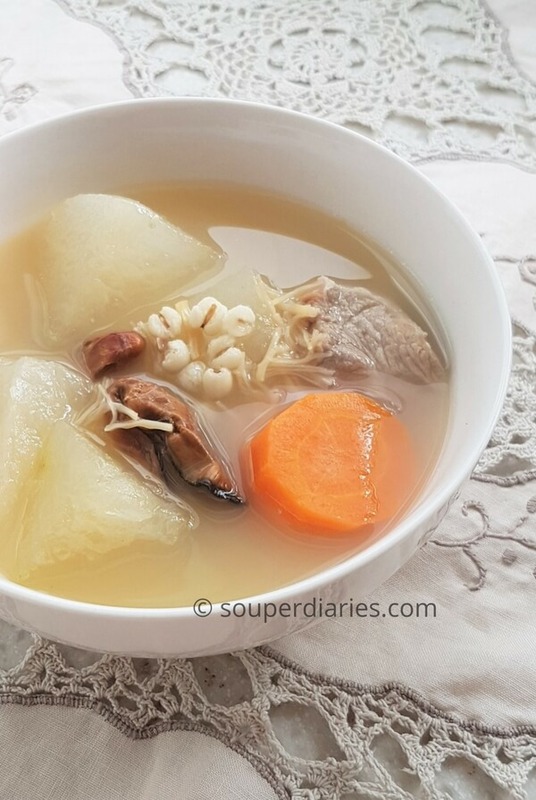 Chicken stock can be used as the soup base or you can sweeten the soup by adding ingredients such as dried cuttlefish, dried oysters, dried honey dates or dried scallops. They are commonly available at local Chinese dried goods stalls and Chinese medical halls. Although it is called winter melon, it needs very warm weather to grow. The reason for its name is because it can be stored for as long as 12 months – even throughout winter. However, once cut, it will be like a ‘normal’ vegetable and will not last as long. Winter melon can be cooked in many ways and for this recipe, I added barley to boost its diuretic and cooling effect. People who are weak with loose stools should eat winter melon in moderation. This is the barley I used for the soup. Note that they are different from the smaller barley variety. Called Job’s Tears, they are also known as coix seeds. It is a common ingredient and available in any Chinese medical shops or the Asian dried goods section of your local supermarket. 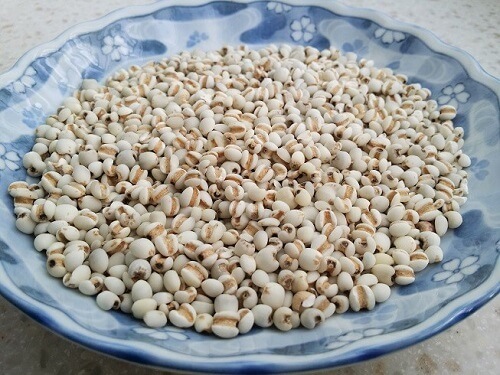 Although they are commonly marketed as Chinese pearl barley, they are not related to the barley family. 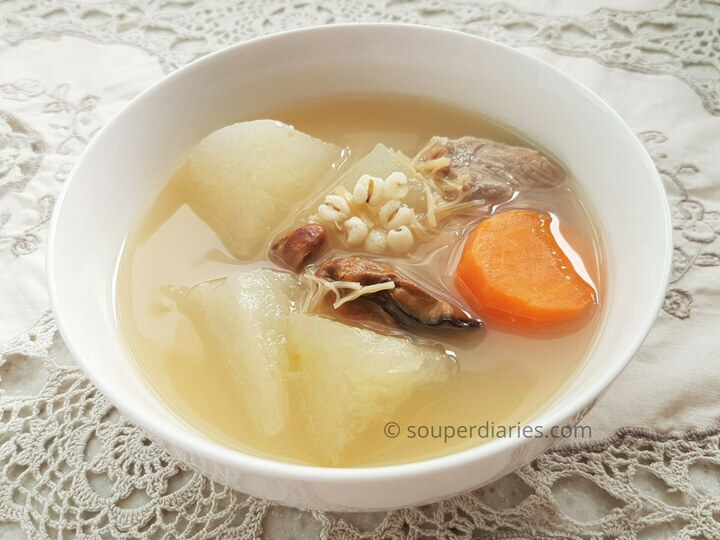 This winter melon with barley soup is light and goes well with heavy and oily foods. I love having soup after a heavy meal to ‘wash’ everything down. Don’t want to miss any new recipes? Subscribe to Souper Diaries newsletter and have the latest recipes and updates delivered to your inbox! Let’s connect on Facebook, Instagram, Pinterest, Twitter and Google+. See you soon and happy cooking! Winter Melon Soup with Barley helps to eliminate excess fluids, clears internal heat and weight loss. Blanch pork ribs in a small saucepan of boiling water to remove impurities for about 5 minutes. Pour away the water and rinse the meat. Set aside. Combine all the ingredients except winter melon into a soup pot (I used a clay pot) and bring to a boil. Then reduce heat to low and simmer for around 1.5 hours. Add the winter melon only in the last 30 minutes of cooking. Season with salt to taste and serve. If you want the winter melon to have more 'bite' and not become too soft, add them in the soup only in the last half hour of simmering. Yvonne O is a soup lover, dreamer and lover of creativity. She's usually in the kitchen cooking, reading or blogging. According to her kids, she's addicted to her laptop and has OCD about cleanliness. OMG, it reminds me of my childhood! My nanny used to make this for me, it tasted very mild and refreshing, the sweetness from the melon and carrot were just perfect! Even after so many years, i still can remember this. But I never make it by myself, and recently I’m really craving some Chinese soup, so its gonna be my tonight dinner! 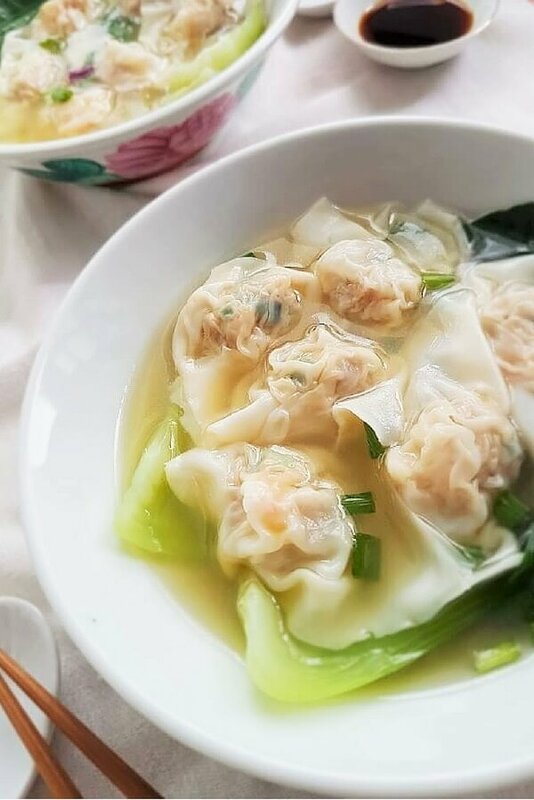 Thanks for sharing the recipe, hope you upload more soup recipe! This soup looks yummy …. will it taste as good if I don’t add barley? It will still taste good but adding barley is believed to promote diuresis, benefit the gall bladder and rid the body of toxins. You can also check out this winter melon soup with lean pork and straw mushrooms too. My mother always use to make a winter melon soup for our 5 siblings. I like winter melon soup! It’s very soft and easy to eat. The fact that it absorb the flavor of the soup as you mentioned making this vegetable taste better than any other. Thank you very much for sharing a great content here! Yvonne, you made me crave for soup! This looks so refreshing and light. The first time I’ve tried winter melon was in the form of milk tea, and I really love it! I’m sure this tastes great and would love to give it a shot. Since I don’t eat meat, do you think the recipe will still be good if I remove the pork ribs? Welcome to Souper Diaries. I’ve not tried winter melon milk tea yet but I’m pretty sure it will taste great as I love winter melon. If you’re not using the pork ribs, the soup will not be as sweet so I would suggest using chicken/vegetable stock to replace the water. Hope that helps. I love barley and I love winter melon! This is a very cleansing treat I most definitely need to try. Would it taste much nicer if I add in taro balls and basil? I saw that in the Asian Food Channel but I missed the recipe though, would be really cool I can learn how to use those ingredients.